Vietnam, a country with 1,000 years of Chinese rule and, more recently, over 100 years of French influence, is not shy of new inventions when it comes to food and drink. While the Chinese introduced the concept of food and drink as medicine, the French contributed coffee in 1857. Vietnamese also make the most of their rice, fresh herbs, and ripe tropical fruits, leaving nothing to waste. This Southeast Asian country on the South China Sea known for its Buddhist pagodas, beaches, rivers, and bustling cities, is a source of inspiration for any food or drink concoction. It was the coffee culture and their all-prevalent fresh, grassy coconut water that inspired me to come up with this refreshing cocktail heavy on the black brew. Coffee plays a significant role in Vietnam and especially in the capital Hanoi, right at the heart of the country’s coffee culture. 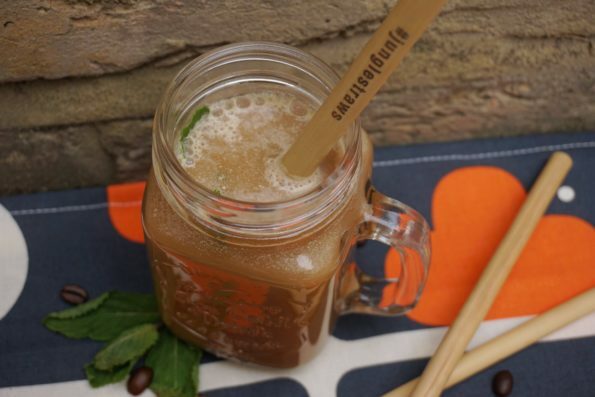 In the summer, of course, Vietnamese iced coffee (ca phe da) will be the go-to drink. Add coconut to this and you’ll have a richer, tastier version. Add some alcohol to this to turn it into a cocktail and you’ll be faced with pure indulgence. Coconut water, another quintessential drink of the country, but one that has been around for centuries, is another irreplaceable ingredient that gives us a taste of Vietnam. There, the water is drunk straight out of the fresh coconut (called dừa tươi in Vietnamese) – pure bliss if you ask me. This go-to drink for re-hydrating is a grassy, sweet little piece of heaven. And you can add that right to your heavenly cocktail drink. It’s a simple and yet original cocktail, which doesn’t require any complicated ingredients or grand expenses. If you’re into coffee, coconut and cocktails, chances are you’ll already have these ingredients on hand. What a win-win situation! It requires no extra money spent or trip to the supermarket, and it’s awesome for the environment (and making you feel good about yourself too! >_<). But this is not all! 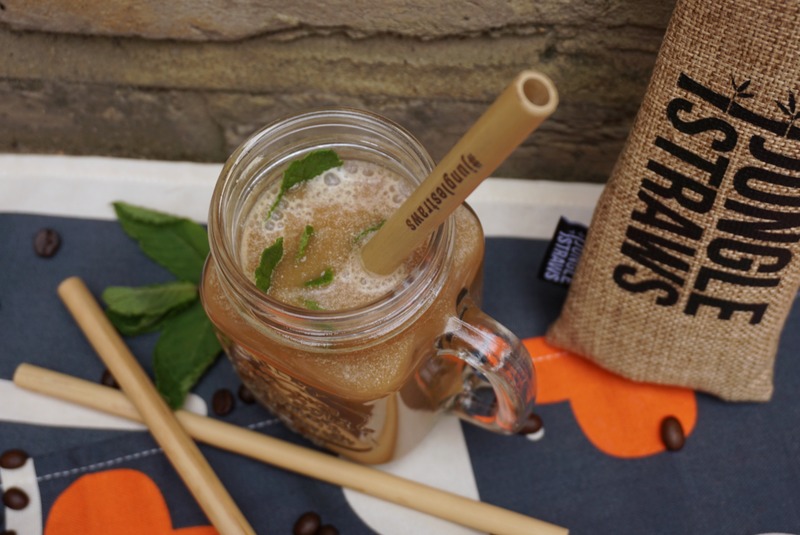 You can even enjoy this cocktail with straws made from sustainable bamboo handmade in Vietnam, as I have. They feel and look amazing, and the best part is, no one straw is the same. 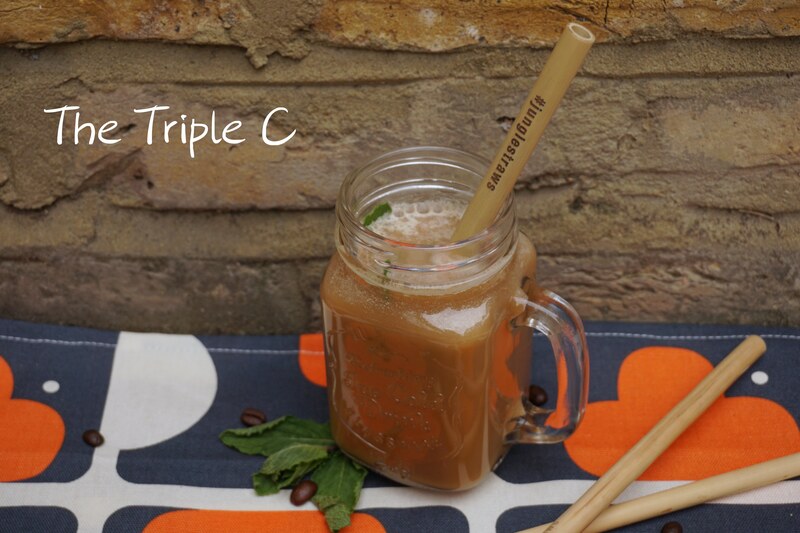 With mixed widths, the straws give me a new drinking experience every time! It’s the little details of how you enjoy your food and drinks that really make the difference. And Jungle Straws has an amazing story behind it too. 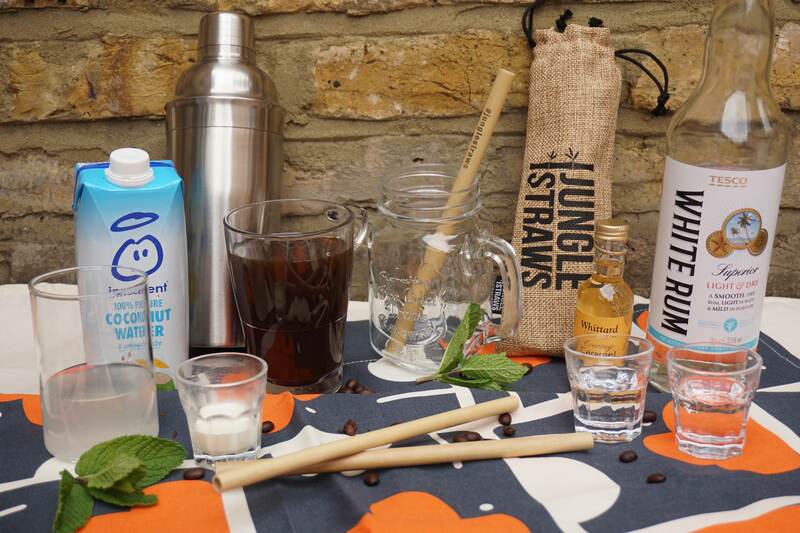 In the wake of #StopSucking, the now-ubiquitous movement of hating on plastic straws and country after country implementing laws to ban its use (you can read all about it here), Jungle Straws has taken a stand as a company that cares about its environment and team of suppliers, leaving nothing to waste and supporting a plastic-free world. The family-run farm in rural Vietnam where the bamboo is ethically sourced and lovingly handmade, is located 150km south of Hanoi, near the picturesque town of Ninh Binh, deep in the dense thick jungle of Thanh Hoa province. Following their zero-waste ethos, the entire bamboo stalks are used, resulting in straws with slight imperfections and varying in thickness. They achieve their sun-kissed natural look by being left to dry on large hessian rugs in the baking hot Vietnamese sunshine for up to one week after being crafted. You can tour the farm and read more about their bamboo-straw crafting here. As I sat writing this article and sipping my refreshing coffee coconut cocktail, it certainly helped transport me to the lush, idyllic forests of Vietnam – the power of imagination (and images stuck in your brain from impressionable documentaries) never ceases to surprise me. 1) Brew the coffee and set aside to cool. 2) Combine the rum, coconut water and 1tbsp heavy cream in a shaker with ice cubes and shake vigorously for about 20-30 seconds to chill and froth the cream. 3) Strain into the glass. 4) Pour in the chilled coffee. 5) Add brown sugar or caramel syrup to taste, and mint leaves to garnish. 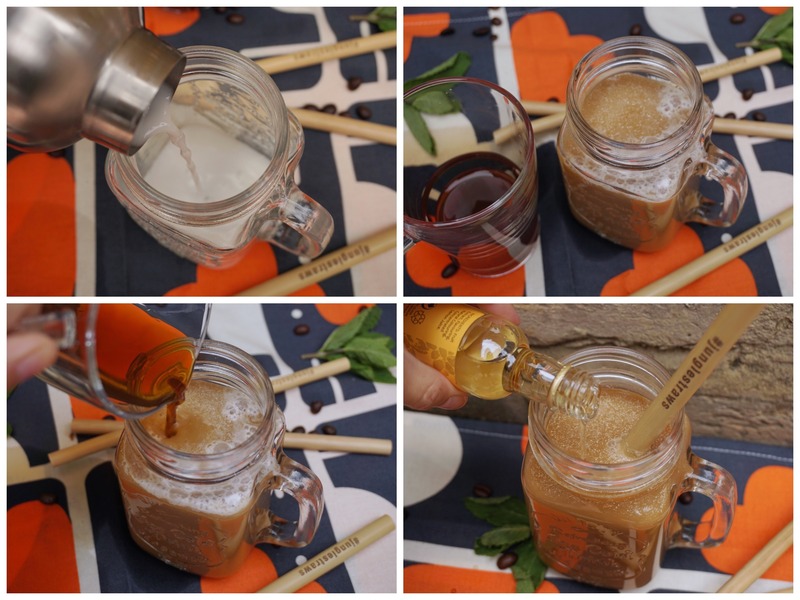 Tip: During the colder season this cocktail can also be made with freshly brewed hot coffee, sans ice, for an aromatic, warming drink. Whip 4-5tbsp of heavy/double cream until it just begins to thicken and has a few bubbles. 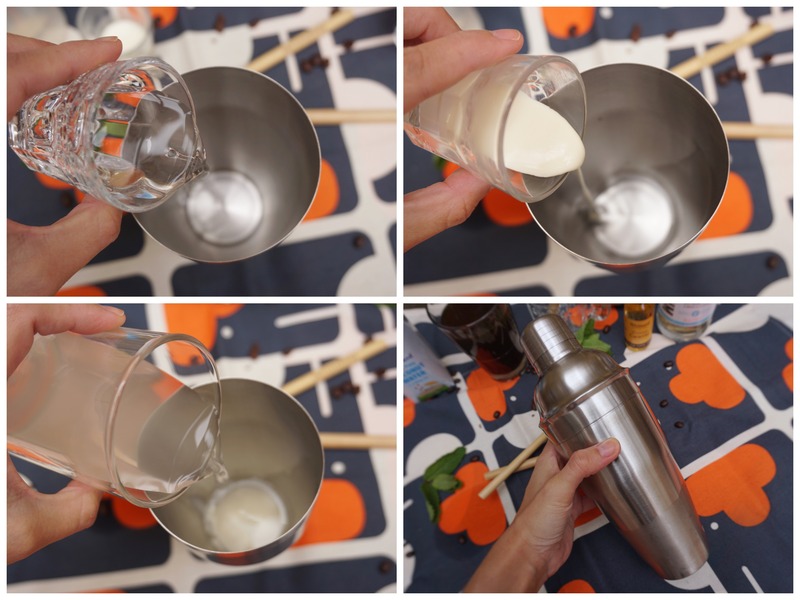 Create a cream float by gently pouring the cream on top of the coffee over the back of a spoon.